It’s not every day you get to work with your marketing role models. But just last year, we were lucky enough to work with ours. Yup, I’m talking about Drift — one of the fastest growing B2B SaaS companies in the world. More specifically, their small marketing team that has managed to break through the noise and win thousands of loyal customers — and superfans — in a market that’s swarming with competitors. While it would be easy to attribute Drift’s success to luck, having worked closely with their marketing team I can honestly say that luck plays absolutely no role in hypergrowth. In fact, we dare to argue that marketing teams everywhere have a lot to learn from the Drift team — because we’ve become better marketers just by getting to work with them for a short while. 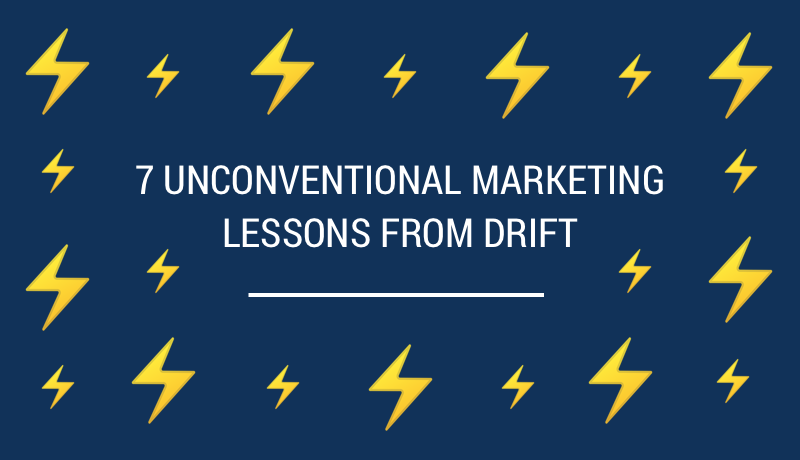 So here it is: the 7 unconventional nuggets of wisdom that you can swipe from the Drift marketing team today. That’s a literal quote from Drift CEO David Cancel on a recent episode of the Growth Hub podcast. And true enough, our friends at Drift are all about going against conventional wisdom and doing things that don’t scale. Instead of spending their days obsessing over MQLs and SQLs, they reply to every tweet, spend hours on brainstorming blog titles, and even go out of their way to pick up HYPERGROWTH guests from the Boston airport. While all this may sound counterintuitive in a hyperspeed world, it totally works. Why? Because while everyone else is busy automating things and chasing leads they can nurture down a rabbit hole (also known as the funnel), the Drift team knows that if they continue treating people like people and not as leads, the business will scale eventually. And when the people they’ve built relationships with eventually realize they need a conversational marketing platform, they’ll naturally turn to Drift. Key takeaway 📚 The next time you’re tempted to pose the million dollar question “but will it scale?”, take a deep breath. Remind yourself that if it’s something your audience will love, it’s probably worth doing. Unlike many older martech companies, Drift entered the market knowing that they’d have to go big on brand. After all, by the time they launched the first version of the product, they were already competing against thousands of other vendors with equally experienced founding teams, awesome products, and customer-obsessed mindsets. Nope. They’ll explain that their brand is the combination of experiences people have with not only the product but also their marketing, sales, customer service, and so on. And of course, the main objective of brand marketing is to make all those experiences as positive as possible. And if that means having to ungate all their content to appear more approachable and human, they’re happy to do it. Because at the end of the day, you can’t exactly say your brand is all about conversations while you’re hiding your most valuable content behind a form. Besides, a strong brand will get you better leads. Key takeaway 📚 Think of your brand as a multiplier. A weak brand will weaken your lead generation efforts, whereas a strong brand will act as a magnet that’ll draw even more ideal customers in. I know I started with “it doesn’t have to scale immediately” and “go big on brand even if that means sacrificing some short-term leads” but here’s the kicker: Even though it may sound like a bit of a contradiction, the Drift team is also seriously good with numbers. It’s because they don’t waste any time obsessing over vanity metrics. They have a no-BS attitude towards data. And so they only measure what matters. In practice, it means that each member of the marketing team owns one number. For example, Janna who’s in charge of HYPERGROWTH owns ticket sales, and Sara who runs Drift on Drift owns leads through chatbots. No one will tell Janna or Sara how to do their jobs. Instead, they set their own goals, are held accountable for them, and are personally responsible for figuring out how to reach them. No micromanagement. No freeloading. Just extreme ownership. And that’s not something we see every day. Yet, as an external marketing partner it makes our work easier because it means that we don’t have to circle one piece of content through the whole department for endless rounds of comments and approvals. Instead, you’ll get feedback ridiculously quickly from the one person who knows exactly what they’re trying to achieve and knows exactly which edits are worth doing. Key takeaway 📚 Make sure that each and every member of the marketing team knows exactly what success looks like in their role. Help them set the goals and then get out of their way so they can execute. Another highly irregular thing about the Drift marketing team is that they’re experts in making their work visible to the rest of the company. So while the small marketing team can only make so much noise about the platform, they’ve made it their business to turn everyone in the company into a marketer. But not all companies are like Drift. In fact, it’s not all that uncommon for product-led companies to treat their engineers and designers like rockstars, and everyone else like a support function. Meanwhile at Drift, the marketing team takes every opportunity they get to talk to the rest of the company about what they’re working on and why it matters. They’ll share early versions of new website layouts, messaging decks, and campaign materials. Because the truth is no one cares about marketing until they’re told why they should care. And because of all that hard-earned trust and respect, everyone from the leadership team to the product team is happy to help get the brand out there. Key takeaway 📚 One of your most important jobs as a marketer is marketing internally to the rest of the company. Organize training sessions, share messaging platforms, and ask for feedback — but whatever you do, don’t skip this step. Speaking of internal marketing, one of its ultimate goals at Drift is to get the whole team to evangelize the company’s regular product launches. And by the way, these product launches are internally known as Marketable Moments. How many product-led companies do you know that collectively think about launches as something other than pushing code live? Now I’m well aware of the reality in that not every company can organize a product launch monthly, but don’t worry — there’s still a lesson in here somewhere. And that lesson is this: It’s okay to talk about your product. You see, besides the whole “to gate or not to gate” debacle, the other big problem with traditional inbound marketing is that companies often end up producing endless streams of top-of-the-funnel content that has seemingly no connection to the product. And while you may also need content like that to drive backlinks and improve your domain authority et cetera, et cetera, it becomes a problem if it makes you de-prioritize content that’s closer to the product. Key takeaway 📚 Don’t just hide behind off-topic ToFu content. Talk about your product and make sure that your ideal customers understand what it’s good for. From weekly lunch & learn sessions to shared swipe files, the Drift marketing team views pretty much everything as a learning opportunity. And so should you. Because the funny thing about marketing is that you can only do the same thing for so long until it stops working. Think about banner ads, organic social, or those gated ebooks. All perfectly beneficial tactics at their time, but no longer the lead generation machines they once were. Maybe the most stealable learning idea of them all, however, is the concept of role models. In other words, people — dead or alive — whose work you admire either from a close proximity (think coworker) or from afar (think famous author). It’s genius, really. Because the point is that instead of committing to a long-term mentor-mentee relationship with one person, you can learn so much more and so much faster by observing those around you. Key takeaway 📚 1) Only work with people who are naturally curious and always looking to develop their skills, knowledge, and ways of working. 2) Look for learning opportunities around you. Actively observe your coworkers, customers, and partners to pick up new skills. Speaking of speed, I’ve never worked with an in-house marketing team that moves as fast as Drift. It’s dizzying. And insanely cool for us, because there’s nothing we love more than seeing our partners get results fast. If you want to achieve hypergrowth, you absolutely need to move fast. You should, of course, spend enough time on the things that make the biggest difference, e.g. your marketing strategy, the right angle for a piece of content, and the title of your newest blog post. However, once these fundamental, success-defining pieces are in place, you also need to learn how to press that publish button pretty darn fast. And then get ready to do that a hundred times over if it’s working. And especially if it doesn’t work, you need to be able to pull the plug quickly and come up with something else. Because the clock is ticking. If you’re interested in learning more about how the Drift marketing team does marketing, you can order This Won’t Scale for free. And if you’re looking for a strategic marketing partner that plays by these very rules, talk to us. We’re happy to hop on a call to see if we can help steer your company towards Drift-like hypergrowth.